Bath’s Jenna Wireman dribbles against Van Wert’s Elizabeth Tomlinson during Monday’s Division II sectional semifinal match at Bath High School. Bath’s Chandler Clark dribbles ahead of Van Wert’s Liesel Hope Larry during Monday’s Division II sectional semifinal match at Bath High School. 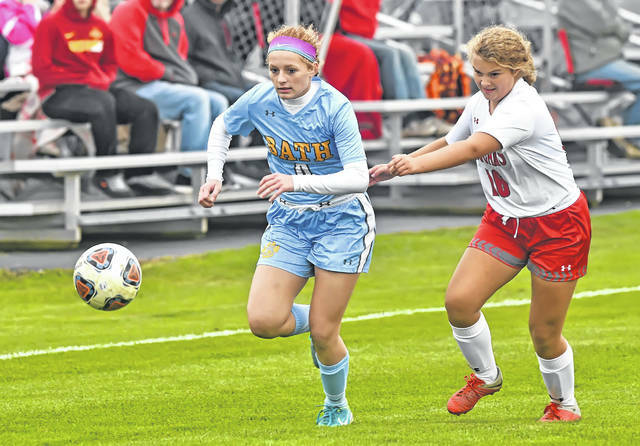 BATH TOWNSHIP – Van Wert climbed within one goal of Bath just before the half. But all that did was set a fire under the Bath offense coming out after halftime. 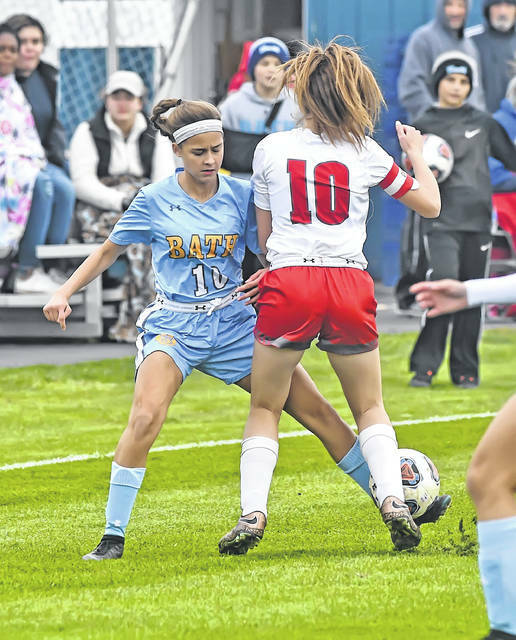 Bath scored seven goals in the second half to pull away with a 9-1 victory over Van Wert in the opener of the Division II girls soccer tournament Monday at Bath. Bath led 2-0 before Van Wert’s Elizabeth Tomlinson scored a breakaway goal from 30-yards out to get the Cougars within 2-1 with 52 seconds left before halftime. After that, Bath took complete command. Bath (10-4-2) advances to the sectional championship against Elida at 6 p.m. Thursday at Elida. Van Wert ends its season 1-13-2. Bath sophomore forward Chandler Clark led Bath with a three-goal hat trick, her second hat trick of the year. Abbie Dackin had two goals and one assist for Bath. Caylee Rieman had one goal and one assist. Ainsley Miller, Faith Kindig and Kaylee Grant all had a goal for Bath. Bath outshot Van Wert 22-1, including 10-1 in the first half. Bath had a 10-0 edge on corner kicks. Bath goalkeeper Emily Rocca, who has six shutouts this year, didn’t have a save. Grace Dowler had 11 saves for Van Wert, while Rebecca Rigdon had one. Bath knocked off Van Wert 5-0 in the Western Buckeye League match earlier this year. Wert packed in its defense in the first half, clogging up the 18-yard box with defenders and several midfielders. Bath broke through at the 24:28 mark of the first half when Abbie Dackin sent a pass into the box and Rieman chipped it high into the back of the net from 7-yards out. That gave Bath a 1-0 lead. Clark made it 2-0 when she drilled a shot from 10-yards out on a pass from Jenna Wireman from just inside the box. That came with 16:54 left before the half. Bath’s offense then hit a lull and Van Wert’s Tomlinson got loose on the counter. She picked up a ball at the center circle and dribbled down before firing a shot just under the bar for a goal from 30-yards out. That brought Van Wert within 2-1. Bath’s midfield took hold early in the second half with its five midfielders in its 4-5-1 formation. Leading the way were Wireman, Rieman, Abbie Dackin, Miller and Tori Dackin. Once into the offensive end, Bath began firing shots from the 18-yard line and out. Clark got a breakaway early in the second half and took the ball to the top corner of the 18, where she rifled a line drive shot into the net from 18-yards out. That gave Bath a 3-1 lead with 37:07 to go. Rieman then fed Clark in the heart of the box and Clark one-touched it home from 14-yards out to make it 4-1 with 36:10 to go. Jordan Craig then took a shot from 35-yards out and Abbie Dackin tapped it into the net from her place just outside the left goal post. That pushed the Bath lead to 5-1 with 29:45 left. Van Wert had no offensive chances in the second half. https://www.limaohio.com/wp-content/uploads/sites/54/2018/10/web1_Bath-vs-Van-Wert-RP-003-1.jpgBath’s Jenna Wireman dribbles against Van Wert’s Elizabeth Tomlinson during Monday’s Division II sectional semifinal match at Bath High School. https://www.limaohio.com/wp-content/uploads/sites/54/2018/10/web1_Bath-vs-Van-Wert-RP-005-1.jpgBath’s Chandler Clark dribbles ahead of Van Wert’s Liesel Hope Larry during Monday’s Division II sectional semifinal match at Bath High School. This entry was tagged bath, vanwert. Bookmark the permalink.